And we’re happy for him! 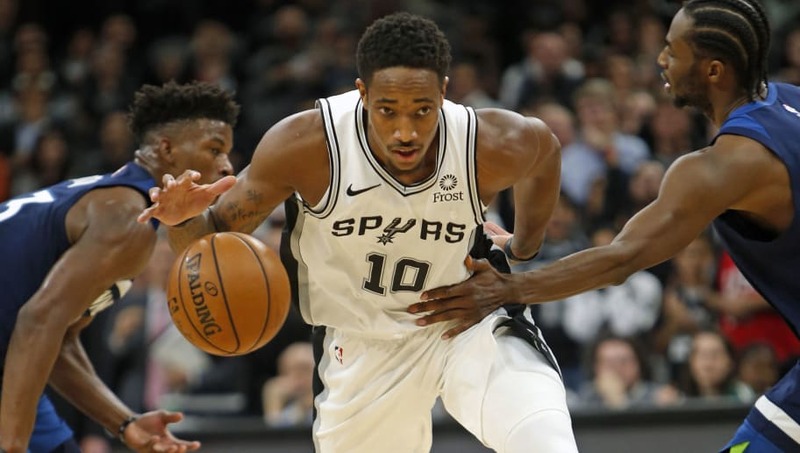 The newest San Antonio Spur had a lot to say about the transition from being a Toronto Raptors franchise centerpiece to being shipped across the continent to San Antonio this past offseason in a trade that netted the Raptors Kawhi Leonard. ESPN writer Michael Wright had the full story. DeRozan tells Wright about transitioning to a new franchise after spending his first nine seasons in Toronto. Rudy Gay, who was a teammate for two seasons on the Raptors with DeRozan, was integral in getting the All-Star to buy in to the “Spurs culture”. He also felt accepted from the very beginning, as local Graffiti Artist Nik Soupè welcomed him to San Antonio before he had ever even donned a uniform. DeRozan is currently leading the 4-2 Spurs in points and assists, averaging around 28 and 8 respectively. While those are unlikely to continue, they are both career highs thus far, and his passing is especially encouraging considering the most assists he’s averaged in a season is five, which he did last year. This has led to the Spurs even letting him get some run at point guard. The Spurs look like they got the guy they wanted, and DeRozan may have just found another home.